There’s a lot to keep an eye on as a driver - the road, your mirrors, your speedometer… and, of course, the price of gasoline. 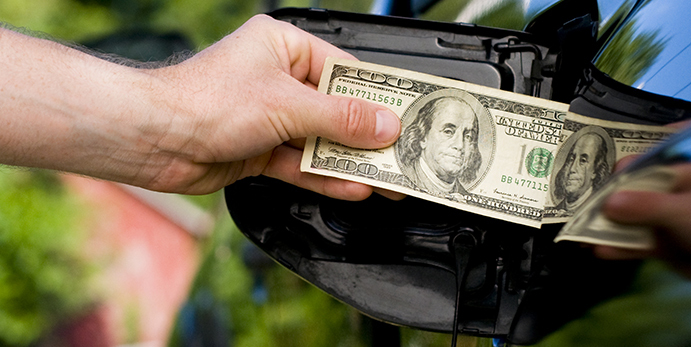 This is the first post in a three part series on what’s driving gas prices, and how you can save at the pump. According to the latest analysis released by GasBuddy.com, the national average price of gas is finally starting to fall after reaching a peak of $3.657 at the end of April, expected to be the highest price we’ll see this spring. While this year’s peak is about 18 cents per gallon higher than prices from this time last year, it’s much lower than last year’s February peak of $3.74. Analysts predict that prices will fall another 3 to 10 cents by Memorial Day, and are expecting the lowest summertime gas prices that the nation has seen in several years. But why do gas prices peak in the spring at all? Is it just because people do more driving in the pleasant summer weather, or are there other reasons for the increase we see each year? Demand for gasoline in the U.S. does increase by a few percentage points per month, beginning in February. To put this in perspective, a 1% increase in U.S. demand for gasoline is about 87,900 barrels - about the same as what a small refinery could produce in a day. These increases seem small, but they add up quickly. NACS, the Association for Convenience and Fuel Retailing, reports that gasoline demand in August 2013 was 10% - that’s 836 billion barrels - greater than it was in January 2013. This added stress makes the fuel distribution system vulnerable to supply disruptions caused by geopolitical events or severe weather, which could cause gas prices to rise even further. Demand isn’t the only factor driving higher prices. The fuel you buy in the summer is actually more expensive to produce, and the process of making the switch limits the supply of gasoline even further. Refineries and retailers are required by law to produce a special blend of gasoline for the summertime. Federal, state, and local laws overlap to create a complex set of requirements for each area, but in general, summer production begins in April and ends in September. Winter-blend fuel is made to evaporate at lower temperatures, so that your car will start more easily and run more smoothly in the cold. To accomplish this, refineries can blend in cheaper materials that evaporate more readily. But fuel that’s just right for cold temperatures can cause problems in the summer. Evaporating gas contributes to ozone and smog levels, and can cause vehicle performance problems like vapor lock. To avoid this, summer-blend gasoline has to be refined even further. This means that each barrel of oil doesn’t make quite as much summer gasoline as it would make winter gasoline. It also has to contain materials that don’t evaporate as easily - which tend to be more expensive. The summer blend is the most effective option for warm temperatures - it actually contains 1.7% more energy than the winter blend - but it’s more expensive for refineries to produce. So while you may get better gas mileage, the prices you see at the pump tend to be higher than during the winter months. Refineries have to be in compliance with summer regulations by April 1. Switching from winter to summer blends requires significant work and “downtime” at refineries, so companies often schedule other maintenance work for the same period. Since refineries can’t operate at full capacity during this maintenance “season,” the supply of fuel decreases temporarily, contributing to the rising price. It takes several weeks for summer gasoline to travel through pipelines and reach distribution terminals across the country, so terminals have until May 1 to purge their winter fuel. Since failure to comply with the requirements results in a steep penalty, terminals are more willing to risk not having any inventory than being late to comply. These low inventories at the terminals also contribute to higher prices, especially as demand continues to increase throughout the season. What Can We Expect for the Summer? This year’s deadlines for refineries and distribution terminals to switch from winter to summer blends have now passed, and GasBuddy.com reports that 90% of scheduled refinery maintenance for this spring has been completed successfully. As refineries and distribution terminals return to normal operations, the U.S. Energy Information Administration (EIA) predicts that national gas prices will average $3.61 per gallon from April through September. Keep in mind that prices can vary quite a bit across the country - while a gallon of regular might cost you $3.47 this week in a state on the Gulf Coast, if you’re on the West Coast you’ll be looking at $4.06 for the same gas. Curious about what’s going on in your local market? Check out AAA’s Fuel Gauge Report, updated daily. American oil production is at its highest level in decades, but it’s been more than three years since the national average price fell below $3.00, according to AAA. Why are prices still so high, and can we expect a return to lower prices in the future?